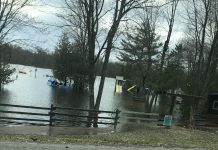 At 2:15 PM Tuesday afternoon, 9-1-1 operators received a frantic call from a homeowner at 1048 Bagley Road in South Gravenhurst near the Severn River reporting that his house was on fire. Arriving firefighters from stations one and two in Gravenhurst found an advanced fire with flames coming through the roof of the home upon their arrival. Flames were spreading in multiple directions and were threatening to spread to an adjacent home owing to the dead, dry ground coverings in the area. Firefighters acted quickly to try and slow the main body of the fire while at the same time moving to protect the adjacent home from the approaching fire. Fortunately, the spreading fire was stopped by firefighters before it reached the neighbouring home which is valued at half a million dollars. Their efforts to halt the main fire in the original home were in vain as the fire consumed the combustible structure. Damage is estimated at $400,000.00. Fire Department officials were told by the occupant of the home that he had been burning debris in his back yard and that sparks ignited the ground cover and house. The man reportedly tried to extinguish the fire for approximately 20 minutes before calling 9-1-1. 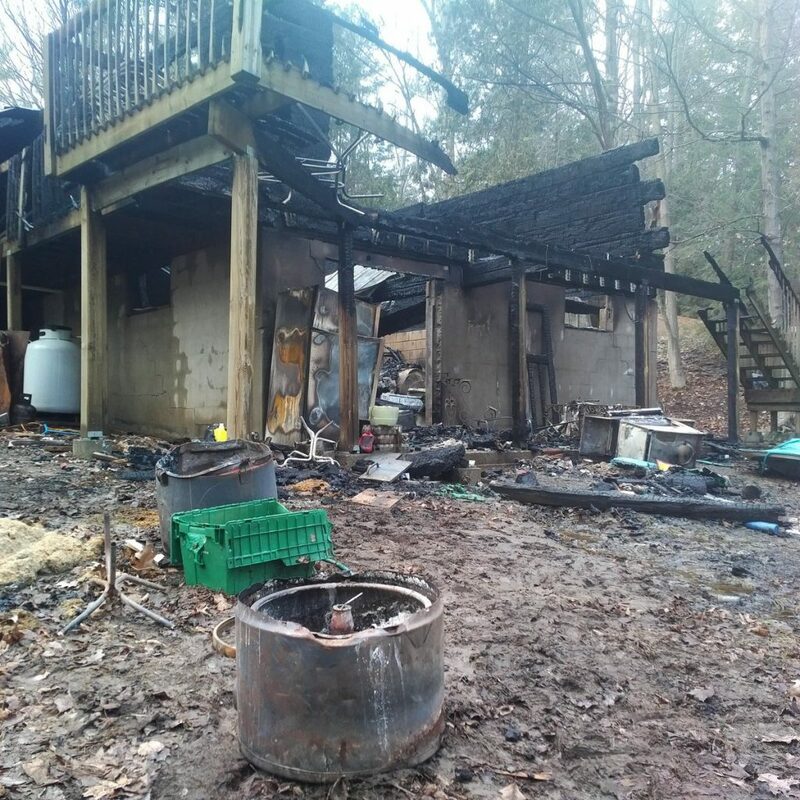 “Aside from the issue that outside burning is prohibited during the daytime in Gravenhurst, this is a dramatic example of what can happen, especially in the spring with home clean-up activities,” said Fire Chief Larry Brassard. “A small unnoticed spark can easily ignite pine needles or dried leaves around a home or cottage, or that may have sat over the winter in eaves trough.” The Chief was quick to add that the practice of burning is strongly discouraged, rather suggesting that yard waste be taken to the dump where it can be disposed of safely, for free. This fire also underscores the importance of calling 9-1-1 quickly in any emergency. 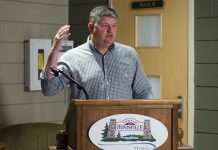 “Especially in the more remote areas of our community where first responders have a long way to travel, every minute is important if we’re to have a chance of making a meaningful intervention,” said Chief Brassard who quick to praise the crews who responded and credited them with saving the neighbours home from destruction. “Their actions were crucial to preventing a much more serious situation from occurring,” he said. There were no injuries. Crews left the scene at approximately 8 pm. 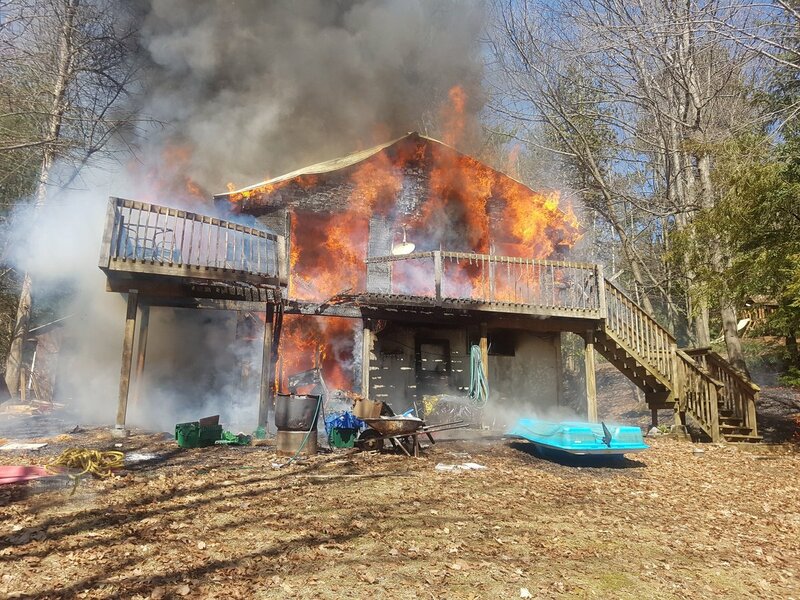 On Tuesday April 16, 2019 at around 2:30 p.m. Gravenhurst Fire crews from stations one and two responded to the report of a cottage fire on Bagley Road near Graham Lane. When crews arrived, flames were shooting out of the cottage. There are no injuries reported. Crews cleared the scene around 8:00 p.m.
Photo provided from the scene by Gravenhurst fire. Great job by GFD! Safe day to all our first responders!